Oh hey, bonus weekend post! I just couldn’t wait until Monday to share this yumminess with you all. This week in Minnesota has been so offbeat in the weather department. The mornings generally have been damp and cool, but by the afternoon it is right back to being sunny and warm-hot (like hot, but less sweltering). Dare I say these cooler mornings have been making me excited for the fall? Though by midday, I’m enraptured again by the summertime sunshine and warmth. So really, it’s been the best of both weather worlds. Well done, Minnesota. 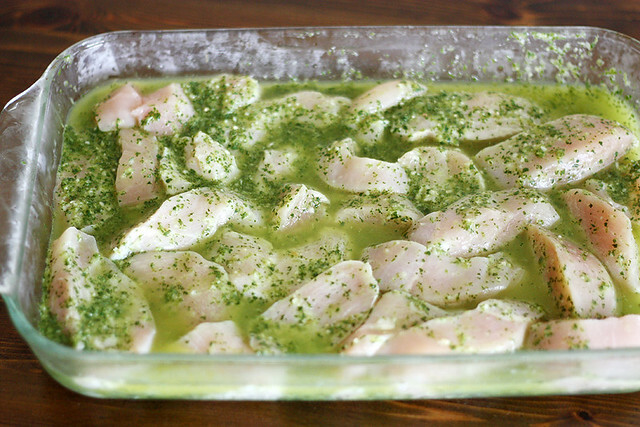 What does this weather-talk have to do with a cilantro-lime chicken bake, you ask? Well, it’s a casserole, which is a quintessential fall dish for me. But it’s not as heavy and rich as many tend to be; instead, this one is lighter, with bright, bold flavors and an awesome, flavorful roasted tomato sauce a la Old El Paso. In other words, it’s a perfect meal for these offbeat, late-summer days. 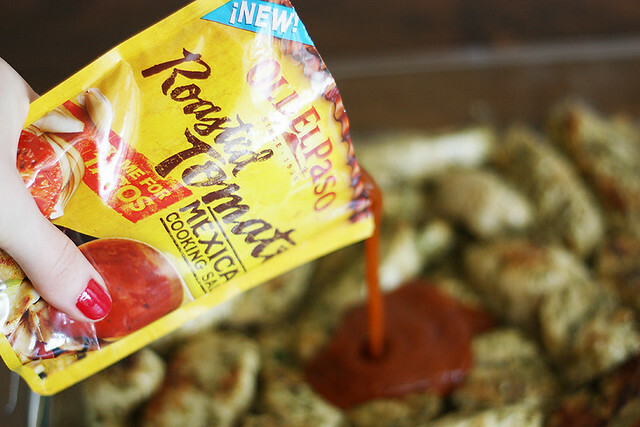 Have you had a chance to get your mitts on Old El Paso‘s new line of cooking sauces? I have to be honest here — as much as I love a good homemade sauce, my laziness almost always gives in and I’m prone to serving pasta with the jar of marinara sauce, enchiladas with the canned enchilada sauce and now, casseroles with the Mexican-inspired cooking sauces. However, the latter is hardly a disappointment for me — when I want a dinner that I know will taste delicious (duh, always) but I don’t have a full day to dedicate to cooking up a homemade sauce, these packets of deliciousness come in handy. This cilantro-lime chicken bake has become one of our favorite ways to incorporate the sauce (not THAT kind of sauce, sheesh) into our dinners. The chicken marinates for several hours in a zesty cilantro-lime marinade, which then gets mixed with homemade cilantro-lime rice. You mix it all up with Old El Paso Roasted Tomato cooking sauce, top it with cheese (ALL THE CHEESE) and bake it until everything is warm and the cheese is browned and bubbly. Don’t be surprised if you feel the urge to snuggle up with it. I know this dish takes a while to make due to the marinating, but what it lacks in time efficiency it makes up for in ease of preparation. Basically, that’s fancy-talk for: This dish is worth the wait. Go to the grocery store today, marinate the chicken and prep the rice tonight and by tomorrow morning, dinner is nearly made. Makes that whole “case of the Mondays” thing a little bit easier to handle, if you ask me. Place chicken strips in a single layer in the bottom of a large bowl or casserole dish. Combine canola oil, cilantro leaves, lime juice and zest, minced garlic, sugar, salt and pepper in a blender or food processor and blend well. Pour mixture evenly over chicken; stir to coat. Cover with plastic wrap and let marinate in refrigerator at least 8 hours or overnight. The next day, combine uncooked rice and vegetable broth in a medium saucepan; bring to a boil, then reduce to a low simmer. Cover and cook until soft and all the liquid is absorbed, about 30-40 minutes. Remove from heat; add cilantro, lime juice, garlic and sugar and stir to combine. Meanwhile, remove marinated chicken from fridge. Pour marinade and chicken into a large skillet; cook over medium-high heat until chicken is just cooked through. Remove from heat and set aside. Heat oven to 350°F. Lightly spray a 13-by-9-inch casserole dish with cooking spray. 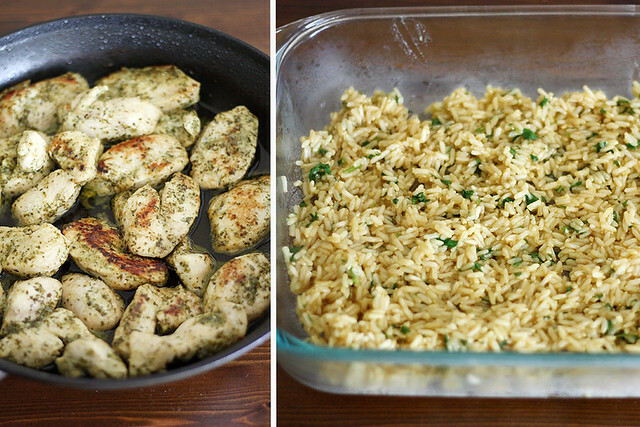 Spread cilantro-lime rice evenly in the bottom of the prepared casserole dish, then top with chicken (don’t add leftover marinade from the skillet). Top with cooking sauce, then sprinkle with shredded cheese. 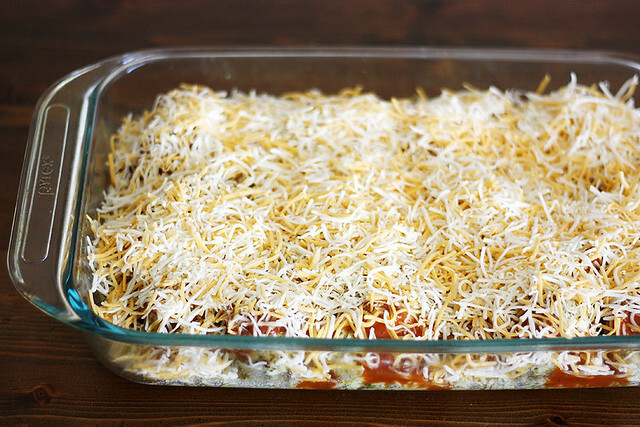 Bake casserole until cheese is bubbly and browned, about 20 minutes. Remove from oven; sprinkle with cilantro leaves, if desired. Serve immediately with fresh lime wedges on the side, if desired. 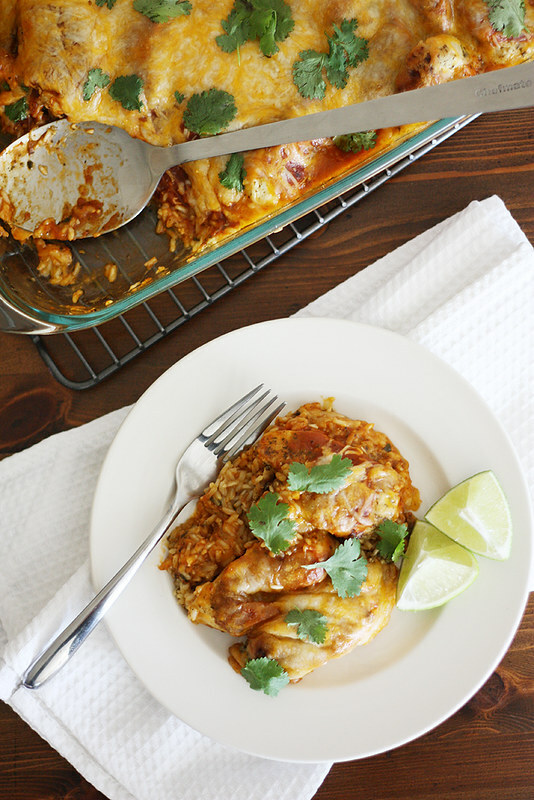 Tex mex rice and chicken is one of my week day dinner staples. Nothing better than a warm bowl of this stuff in middle of a busy working week. I understand the weird changes in temperature; it might be winter in Australia but I think we had one of the warmest days today on record (24C is high for winter). This rice looks great warm or as a cold rice dish! This would be a HUGE hit in my house. Rice and chicken are STAPLES and tex-mex flavors are always welcomed! This is just amazing! Here in Nebraska we are experiencing cooler than normal mornings. It makes me almost ready to say goodbye to summer. I am a huge casserole fan! This looks like it’s loaded with a lot of goodness. Thanks for sharing! 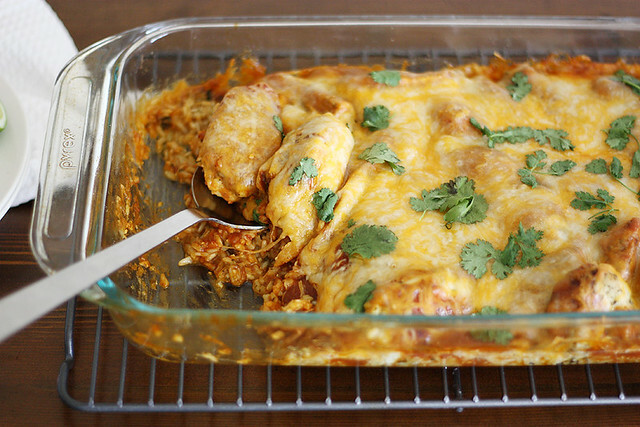 This looks amazing – that layer of cheese on top is calling my name!! Belinda — Isn’t Tex Mex chicken and rice some of the best comfort food? Thanks, dear! Tieghan — Thank ya, lovely! Consuelo — Well maybe it can be tomorrow’s dinner? 😉 Thanks, dear! Rachel — Oh, it took everything to not eat all that cheese right off the top. 😉 Thanks! I am SO jealous of this meal. All of my favorite flavors in one dish. I LOVE it. 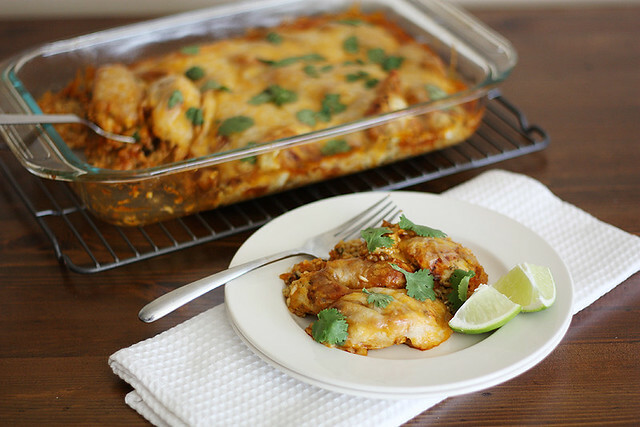 I love cilantro and lime, what a tasty chicken bake! 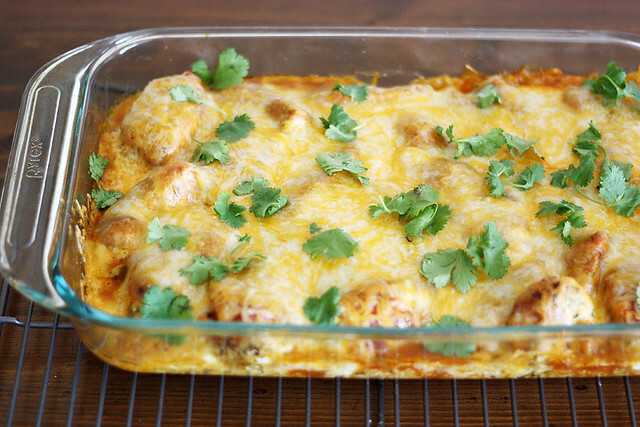 This casserole looks so good. I’m saving this for next week’s menu. Yum! This is SO happening this week in our house! I love these homey, easy bake recipes. One of my fave things to cook and eat. I am not going to lie, I used one of those sauce packets to make enchiladas a few weeks ago. A little laziness is ok sometimes! I am making this for dinner this week for sure! Sarah — Me too! Thanks! I’ve never even heard of these Mexican cooking sauces. Will have to check them out. The casserole sounds great! Megan — You definitely should; they’re pretty tasty! Thanks! Holy guacamole! This looks so amazing! Kelly — Haha, thank you so much! Katie — Yes! Do it! It’s the best when you save it for a cooler day. 🙂 Thanks! Can you sub another herb for cilantro? I know that sounds stupid. I love it but my husband hates it. Stephanie — Not stupid! I know some people hate cilantro. 🙂 You can probably just leave it out altogether, and maybe add some extra spice in its place, like chili powder or smoked paprika. Hope that helps! totally started marinating my chicken this morning for this dish. Can’t wait! Nicole — Enchilada sauce would be a good alternative! Just make sure to use the same measurement. 🙂 Enjoy!